The Hollywood actress Katie Holmes and her daughter were on the Greek island of Lesbos last week working with refugees in the Moria refugee camp. Both Katie Holmes and the organization she was working with, (New York based) Artolution, posted photos on Instagram about the experience. 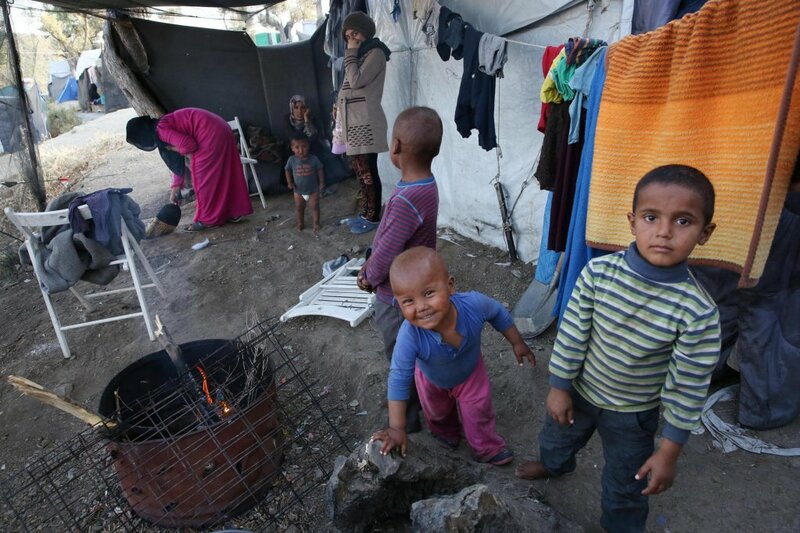 In January this year, the British based charity Oxfam branded conditions in Moria refugee camp on the island of Lesbos “inhumane.” Oxfam was reported saying in the Guardian newspaper that women in the camp had taken to wearing diapers at night “for fear of leaving their tents to go to the toilet.” Another charity, Médecins Sans Frontiers (Doctors without borders, MSF) called it “the worst refugee camp on earth” in August 2018. In a BBC film from the island, the MSF coordinator at the time, Luca Fontana, said that he had worked all over the world, including in Congo and the Central African Republic and during the height of the Ebola crisis. Despite his experiences he “had never seen the level of suffering we are witnessing [in Moria] every day.” That, he said, was because the hope that people might have in other contexts had been taken away from the thousands of people stuck on the island of Lesvos, unable to move forward and unable to move back. Reports in some sections of the media speculate that Holmes might be thinking of making a film of her experiences, but this speculation remains unconfirmed. On Artolution’s own website, they say they are trying to address the Global Refugee Crisis by sending in “teaching artists….to allow young people to creatively explore their experiences while connecting with positive adult role models in their community.” This, they say, is “an important step in the healing process,” for the refugees they work with. In December 2018, the Greek Migration Minister Dimitris Vitsas said that his government was working hard to improve conditions in the camp. In a report by Greek newspaper Ekathimerini, the minister conceded that conditions were "difficult" but claimed that all children in the camp had now been vaccinated, have access to education and music classes. A new government scheme has been working to transfer as many people as possible from the islands to the mainland in order to avoid overcrowding and process people's applications more quickly.